I had no idea what Gaga Ball was until my kids joined scouts. My oldest kid is in Boy Scouts and my younger son and nephews are in Cub Scouts, and after camp I started hearing them talk about this Gaga Ball game. I didn’t fully understand it until I went on my first camp out with them and saw several examples of Gaga Ball pits and watched the game in action. I decided that it would be fun to build a Gaga Ball pit for the kids, since we have plenty of room in our yard for one. 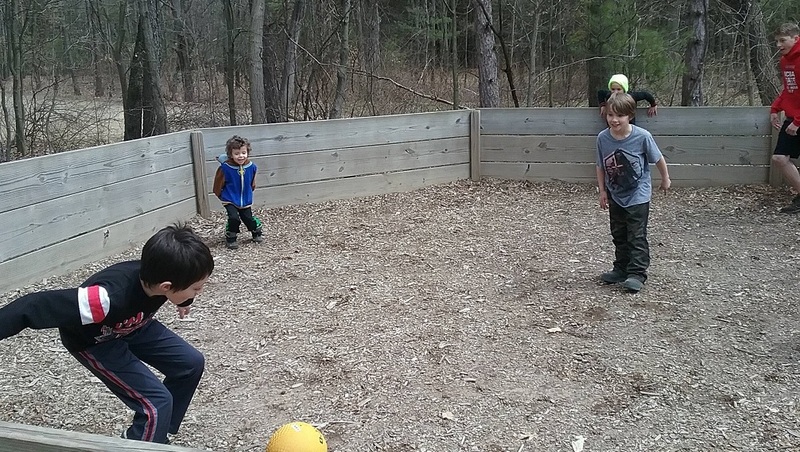 I built a Gaga Ball pit for under $50 in 2 afternoons with the help of a couple kids. 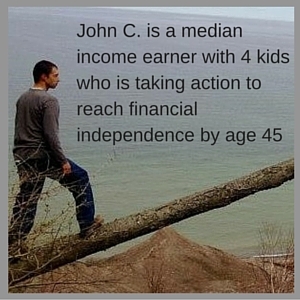 This adds to our existing tree fort, monkey bars, and rock climbing wall projects in our backyard playground. Gaga Ball is basically a game of controlled dodgeball. The game takes place in a walled off area and the players slap the ball at each other with the goal of hitting the other players below the waist. Such a hit renders that player out and the last man standing wins. Players can not hit the ball twice in a row, unless the ball hits someone or the wall in between. Players can hit the ball against the wall up to 3 times in a row. You need at least 2 people to play, however this is a game where the more people you have the better. I’ve seen upwards of a dozen kids playing at once. This is a game that is easy for adults to play as well as kids. The kids have a blast and get TONS of exercise from it, which means they run out some of that explosive energy they have. While at camp we played a ton of Gaga Ball and most of the kids say that it is the highlight of their camping experience. I looked at multiple designs for my Gaga ball pit and I am glad I did. There are no official regulations to the size and shape of a Gaga Ball pit. Generally speaking they are built in either pentagons or octagons and they have a wall height of somewhere between 20 inches and 48 inches. I originally was going to cement my corner posts into the ground for stability, but Mrs. C. assured me that that was not necessary. After completing my build I agree that it would not be necessary, the connections of the wall sections provide enough strength for this purpose. Not needing concrete saved quite a bit of time and money. How much space do you have available? 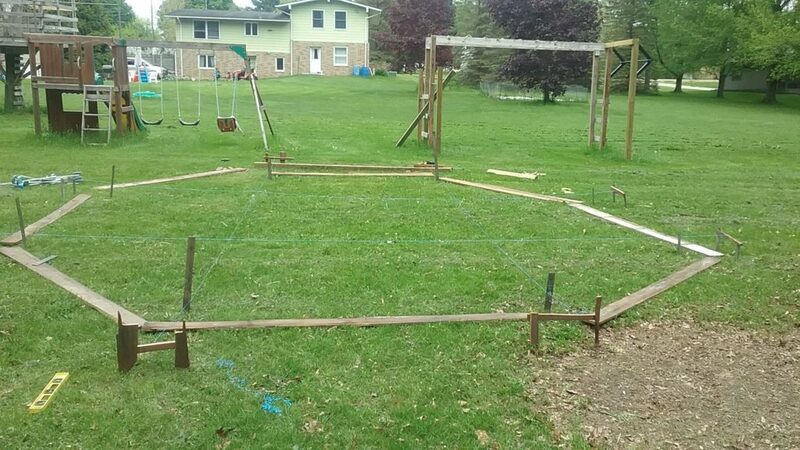 You don’t want the Gaga Ball pit to eat your yard. If you have limited space going with an 8′ pentagon is probably the best bet. I was surprised at how large our Gaga Ball pit ended up, even though I knew how many square feet it would be, until you actually see it it is hard to estimate exactly how much space it will take up. Years ago we bought a trampoline when we had a 50′ X 150′ city lot and that trampoline completely ate out backyard. How many kids will be playing? We have 4 kids that live with us and often we have greater than 6 at the house. Because of this I wanted to go with a larger Gaga Ball pit. If you will usually only have 2 or 3 players then a smaller Gaga Ball pit will do. What is your budget? If you can’t afford the wood needed for a larger pit, building something smaller is much better than not building one at all. Also, keep an eye out for free or cheap reclaimed wood. I have been very successful with obtaining used wood for my outdoor building projects through craigslist and Facebook garage sale pages. 90% plus of the wood I used in this project was reclaimed wood that I got for free. Here are the supplies needed to build a Gaga Ball pit and the cost at Lowes. Below there is a chart detailing how many are needed for each size of Gaga Ball pit. 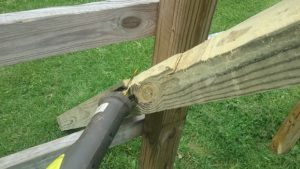 4X4 Pressure treated posts: I chose to use pressure treated wood for any new wood purchased because it will last a lot longer in the elements. Buying 10 foot posts allows you to make 3 3 foot posts or 5 2 foot posts. To save more money you could use landscaping timbers instead of 4X4 posts, which will probably have a slightly shorter life, but are significantly cheaper. I paid $15 for each 4X4X10 post and I could have paid just $3.33 for 8 foot long landscaping timbers. 2X6 pressure treated boards: Once again, pressure treated will last longer, if you only need the boards for a short period of time then non pressure treated or even salvage lumber (like what I used) is a great option. Because so many of these are required, these boards make up the bulk of the cost. 8 foot pressure treated 2X6 boards run around $6.50 each. Exterior Wood Screws: I see a lot of Gaga Ball pits held together with bolts rather than screws, so far I haven’t had a problem, but bolted ones do feel more substantial. If you go this route the cost increases a little bit. A 1 pound box of 3″ exterior screws has roughly 70 screws and runs around $6.50. One of the main attributes of a Scout is that a Scout is thrifty. To me it would be against this attribute to buy everything new and use the “best” material to build a Gaga Ball Pit. 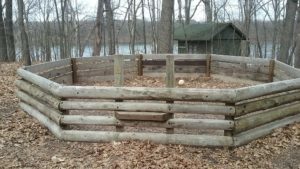 I also don’t need to make mine as robust as the ones at camp since the one in my backyard will receive far less use and abuse and doesn’t need to last as many years, I think some of the Gaga Ball pits at camp were built decades ago. My Gaga Ball pit is an 8′ Octagon, providing over 300 square feet of play area. I built it for a total cost of $42. I did this by using mostly reclaimed wood. The only lumber I had to buy is 2 4X4 posts. The rest of the cost was 2 boxes of screws. I don’t care that it isn’t pretty; it is functional. If you want it to look really pretty the best option is to buy a pre-made set. These sets have really nice looking brackets and all you have to do is buy the wood and pop it in, and these are relatively portable to due to ease of assembly/disassembly, the only problem is price with the brackets (no wood included) starting at around $300. Before building my Gaga Ball pit I did a search on craigslist and on Facebook yard sale sites and found a posting for a bunch of free wood from a barn that had been sitting out for a year. I offered to take it. When I got to the house the pile was much larger than what it looked like in the photo. Most of it was 14′ to 16′ pieces. I cut everything to 8′ lengths on site and loaded up the van, I actually had to make 2 trips. About 10% of the wood was beyond recovery, but the rest was good enough for an outside toy structure that doesn’t need to be structurally stable. Who would have thought making an Octagon would be so hard, and require math *sigh*. I don’t want to admit how much time I spent learning the math, making a drawing, and laying out the Octagon, but it was the better part of an afternoon. Although tedious this was absolutely necessary to building a Gaga Ball pit in the right shape. 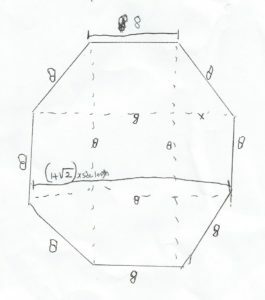 To save you time on building a Gagaball pit I will detail the math involved in making an Octagon below. For an Octagon the distance across it is (1+√2) X side length. This solves to 2.4142 X side length. For an 8′ Octagon 2.4142 X 8 = 19.31 feet. Subtract 8 for the square in the middle, and you have 11.31 feet to distribute on either side. 11.31 / 2 = 5.655. .655 feet / 12 inches per foot is 7 7/8″, so each post should be 5′ 7 7/8″ away from the corners made by the square in the center. Step 2: Precut your boards and posts: The posts come as a square and you need to cut one of the angles off if making an octagon. Essentially every post has half the angle a square would have. I did this with my sawzall, but I’m sure there is a cleaner way to do it. I also cut the posts to 36″. Since I didn’t buy my boards from the store they didn’t start out as exactly 8 feet long. I had rough cut them when I got them and now I needed to cut them to exactly 8′. This by no means needs to be perfect, but the closer the better. Without doing this step the horizontal boards would hit the posts on a corner. I found this idea on a website that talked about building an Octagon deck, same concept right? You take some scrap wood and build a small frame that you can attach a string to and move it left and right on. You build 2 on each of the four main sides of the Octagon. This grid will make a square in the middle. 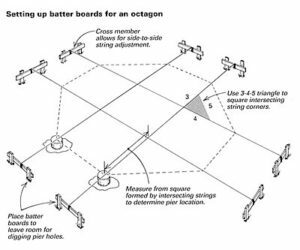 You can measure the string of the square and then move the stringers to the left of right as needed. Once the square in the middle is square, you can measure out from each corner of the square to determine where your posts go. From the math above on an 8′ Octagon, the posts should go 5 foot 7 7/8″ from the corners. Once I had the stringers properly in place I put a stake in temporarily to mark my post locations. Note: Building Is forgiving. This is for a kids toy that doesn’t need to be structural. All it needs to do is not rot away and allow a ball to bounce off of it. Being off by a half inch here or there isn’t the end of the world. I put all my posts out to where I had marked them with stakes before. I then had the two younger kids hold the posts up while I drilled the first set of boards in. I kept them involved for the second set of boards as well as I had a bit of play in the posts still and wanted to get them as level as possible. I attached each board with 2 screws on each side. I also put a 1″ spacer in between the ground and the first board. This allows me to weed wack underneath the board and will keep the boards from rotting, since ground contact is bad. In retrospect I should have made this gap closer to 2 inches. Step 2: Installing the Entrance: For the entrance I used a 4X4 to space out the steps to allow kids to climb in and out. This is enough space for adults to put their feet in to climb in and out as well. 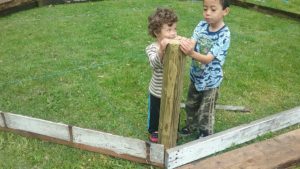 I also cut a 2X4 and used it to reinforce the entrance at two spots so it had more support than just the 4x4s on each side, this made the entrance to the Gaga Ball pit much stronger. Step 3: Install the remaining boards: I put a small space in between each board, I’ve seen Gaga Ball pits that have no spacing and some that have 6″ spacing. As long as a ball can bounce off the wall it will be fine. I wanted to leave a bit of spacing for expansion / contraction and to make it easier to swap out damaged boards in the future. Leaving this type of spacing on all of the sides is a great way to save money on this project and can cut roughly 50% off the cost of the 2X6 boards. Step 4: Sanding / Painting: It’s a good idea to do some rough sanding even on new boards. We played a few rounds of Gaga Ball once I had the structure built and it didn’t take long for kids to start getting splinters. I followed up with some deep sanding on all the top boards and will be painting the entire thing here shortly. To mitigate this I also made sure to tell all the boys not to lean up against the sides or run their hands along the boards. Step 5: PLAY BALL: You can really use any type of ball, but the best are the classic 4 square gym balls. You can actually buy a 2 pack of these with Gaga Ball printing at Amazon for under $11. Remember this game is fun for kids and adults, don’t be afraid to hop in there with the kiddos! I even got my parents to join in the fun. 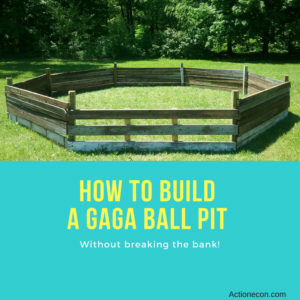 Building a Gaga Ball pit in your backyard is a great way to increase the activity level of the whole family, and have a blast while they are doing it. What do you think about Gaga Ball? Anyone going to build a Gaga Ball pit in their backyard this summer? 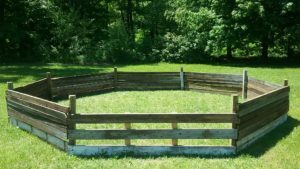 8 Responses to "How To Build A Gaga Ball Pit For Under $300"
I am getting a gaga pit plan right now…. I am a middle school PE teac 6.7. and 8th graders … We have some classes as big as 35-40 and some smaller… What is the ideal size I should build…. 8′ or 10′ length walls??? and the height?? I am thinking higher than 41″?? High school kids may use it also…. Also, it is going to be built on grass…. is there anyway to prevent a mess later?? or just let it get down to the dirt?? Wow, that;s a lot of kids. I wrote this article geared towards building for a relatively small number of kids. For 35-40 kids I think you would want to build similar to the ones they had at my kids camp which were at least 12′. 12′ side walls for an Octagon will get you almost 700 square feet. It really doesn’t need to be super high, no mater how tall you build it occasionally the ball will get knocked out. I have seen a few as high as 48″ but then it feels like the kids are in a jail cell. I wouldn’t go any higher than 42″ myself. I’m letting the grass get ground down in mine and I haven’t done anything yet. Your application will get WAY more use than a backyard gaga ball pit tho. You may want to try to woodchips, that’s what they had at camp (the picture above with the boys playing in the nicer pit were from camp) With high school kids using it you will want to reinforce all of the sides like I did with the entrance to mine because I’m sure they will be jumping in and out from all sides. Hello, I am considering making a Gaga Ball Pit for my eagle scout project. I am thinking of doing it in a county park, and they will likely want an ADA Gaga Ball Pit. Do you have any suggestions for a door/hinge? I think at the entrance I would split the length and make a gate half the width (4′) and have a support on each side. As far as the hinges go I think a typical door hinge would be sufficient for strength, it would effectively be making a half door. It’s a bit wider but much shorter. I would use 2 hinges total and a simple latch on the opposite side. I just looked up that ADA doorways need to be between 32″ and 48″. For a 48″ distance which I talked about above you might get have the door end up leaning down towards the opposite of the hinge side due to the distance. Maybe making the supports for the door at 36″ would be good and having the rest of the wall be 5′ long. for symmetry and strength I would put another vertical support in at 5′. I’d look into their ordinances on swing sets or play structures, I think it would fall into that category. I live in a small township with no such ordinances. Not only does this help families, but it also helps schools with low budgets. This helps my school a lot.